There’s a curious concept in astrophysics known as the Drake Equation. Developed to quantify the potential for intelligent life in our galaxy, it raises a number of odd questions, among them: does having intelligence, in the long run, actually benefit or harm a species? In other words, will amoebas ultimately outlive humans in the face of eternity? If you’re like me, these are the types of things you think about while listening to hold music before conference calls. But as a content strategist, I can’t help but ask the same question about something my clients suddenly seem to be clamoring for: personalized user content. It sounds great in theory: content that is more targeted to the user can provide a richer, more precise experience. But there is also a dark side: used improperly, targeting risks invading privacy and eroding trust. As Drake supposes, true intelligent life is rare, in part because it has the potential to destroy itself. So how might you dip into this intelligence without wrecking your content in the process? How can we approach personalized content in a way that is sustainable and respectful, not self-destructive? At a basic level, personalization (aka targeting) means serving unique content to a user based on something we know about him or her—from geographic location to specific browsing history. And as you’ve likely observed, the value of personalization is largely in how you wield it. It’s helpful to us when Amazon makes recommendations based on our past viewing history. Conversely, we’ve all been bothered at some point by a creepy targeted ad—the one that either somehow knows too much about you, or is trying to sell something you don’t want. Historically, the average UX person hasn’t played much of a role in either of these scenarios, the latter being controlled by online marketers, the former monopolized by the Amazons of the world. But the recent advent of so-called “experience management systems”—like Adobe Experience Manager, Sitecore Experience Platform, and Episerver Personalization Manager—has (somewhat precipitously) made the ability to personalize content more accessible to clients. You don’t have to look much further than the goodie bag from the last conference you attended to see that all of the big name CMSes are now aggressively marketing their own flavor of personalization software. Your audience can be segmented in ways that are meaningful. 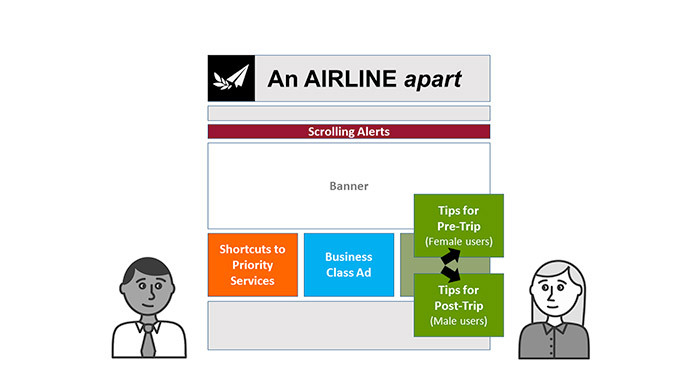 Narrowing your message provides incremental value to your users. Personalized content is tied to specific KPIs or business objectives. You may face some strong headwinds if your client just bought a shiny new EMS and can’t wait to start solving world hunger. Again, as is always the case with the technology du jour, the product demos for these things are very seductive and typically involve light shows and kittens and free ecstasy. You may have to be the voice of reason. But that’s why you went to content strategy school, right? Rules-based: The more manual approach, this involves setting up discrete audience segments in the system and writing rules for when and how to show them content. Example: It looks like Colin’s IP address is from Washington, DC, so let’s show him what we show everyone in that location. Algorithm-based: The “secret sauce” approach, this focuses less on the overall segment and more on a specific user’s behavior. Example: Colin clicks on 3.65 articles/day about soup, so let’s show him a campaign for soup. For our purposes, we’ll take a closer look at a rules-based model, since this is more likely what you’ll be running into if your client is just starting out with personalization. You’ll first need to determine your “segments.” Similar to UX personas, segments are groups of users with some distinguishing set of traits like age, interest, or location. The difference here is that a targeted segment will be determined by real-time data, either internal or external to your site. Typically this data will be fed through some type of centralized rules engine accessed by your CMS. This is all getting a bit abstract, so let’s imagine for a moment that we’re creating a new site for An Airline Apart (obviously the next logical brand extension). We want to target busy creative professionals who travel regularly for work. What online content should we create to give us an edge with this audience? Our first bright idea is to start a content campaign that takes the stress out of business travel. Easy enough, right? But that actually makes a lot of assumptions—what does “stressful” even mean? Can we break it down by audience? Source: Harvard Business Review. Data from HEC, Carlson Wagonlit. There are clear differences: women tend to find the pre-trip phase the most stressful, while for men this is the least stressful phase. And for some reason, at the post-trip phase, it’s the complete opposite. 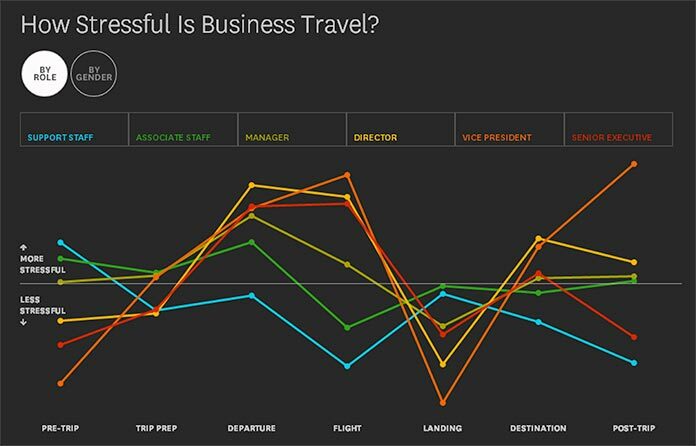 According to this, business travel stress changes wildly depending on company role. For example, high-level employees are least stressed before the trip, and more stressed after; for support staff, it’s the total opposite. Now, if we were doing this properly, we would absolutely want to drive into the “why” behind this. But for the sake of our sample exercise, we have more than enough justification to pursue a segmented content approach to our campaign. We could potentially set up 12 segments across gender and role in our system; here, though, let’s limit our focus to senior execs, male and female. Now in theory, we could write rules to target content for all of these blocks for our users. But how do we know where to begin? This is the “substance” question in content strategy, and where we need to consider very specifically what value we are adding. Content that alerts. This type of targeting improves the customer experience by displaying relevant, time-sensitive information, such as a weather delay, service disruption, or other real-time issue. Content that makes tasks easier. The second “task at hand” category, this type makes users’ lives easier by helping them do what they came here to do—e.g., “smart” navigation, deep links to useful tools, or automatically deprioritizing unrelated content. Content that cross-sells. This type may make your inner designer squirm, but it will realistically be one of your most important use-cases (and likely the one most directly tied to project ROI). Whether you’re a global oil conglomerate or a non-profit that provides hugs to reindeer, this is your place to market whatever it is you need to market. Again, the trick here is to show users something relevant, not just what you want them to see. Examples: ad for a new product, announcement for your upcoming conference, call to join or donate, etc. Content that enriches. A close cousin to the cross-sell, content that enriches a user’s experience is supplemental to their overall brand perception. This might include blogs, articles, community features, social networks, or third-party content. Think of this as the “soft sell” versus the “hard sell.” On a standard task-oriented page, this content will typically occupy the least critical zone. 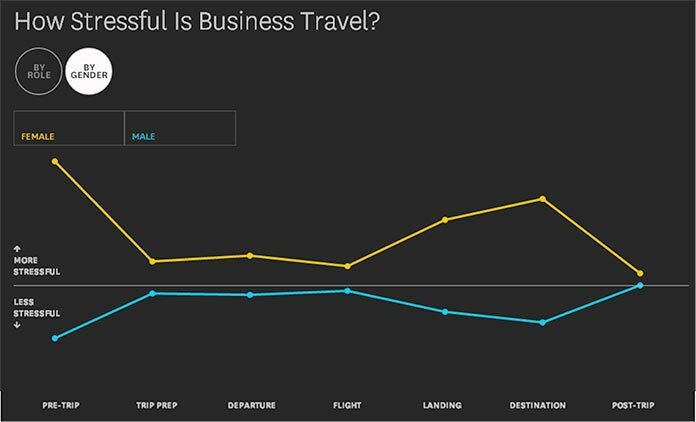 Notice we’re now showing content specific to our executives, with the added nuance that the bottom right zone (“enrich content”) differs for our female versus male audience, based on that research nugget around stressful travel. Bear in mind that these two are looking at the same site at the same time from two different locations—the CMS is targeting the content based on what we know about them, so they effectively get a different experience (and if everything is set up correctly, a better one). You’re starting to see the implications, right? If we were to follow this through, instead of writing one content strategy, we now effectively need to write 12—one for each audience segment we had identified. As a content strategist, you’ve probably swallowed your content gum. The technology is there to help you accelerate that process to some extent, but this is precisely why taking a disciplined approach to personalized content is critical. Otherwise, you will be quickly overwhelmed, not only in terms of creation and execution, but also maintenance and support. What’s that you say? You’re not intimidated? Great! Just a few things to keep in mind. Your content is not semantically rich—you need a taxonomy, metadata, etc. There’s a whole other conversation to be had around the ethics of targeting, but suffice it to say there is a line between providing helpful personalization and invading privacy. If you find yourself trying to force content on people with your newfound power, stop. Think of Ida Aalen’s core model. Is your content truly at the intersection of user and business goals, or just business goals? Approaching targeted content strategy with respect for your users will ensure that your site lands on the right side of web personalization history. Sound like a lot? Consider that it doesn’t have to be that complex. In fact, can you guess the number one method of personalized content in use today? That’s right, email. So chances are you’re probably already doing targeting on some level, and have an organizational starting point from which to build. With the right strategy and technology, you’re really only limited by your imagination, and your ability to adapt to mistakes along the way. And who knows? You may discover that the web can, in fact, support intelligent life. You had me at “If you’re like me, these are the types of things you think about while listening to hold music before conference calls.” Thanks for creating such a clear and accessible introduction to this increasingly clamored-for capability. I believe your micro-taxonomy of core types of content personalization use cases could be improved with a small update. There is a type of content that I think is best expressed by the verb “Educate”. You categorize “Make Easier” (Support) as being related to the task at hand. There’s also a common need to present users with information about how to get more out of their site experience or their overall relationship with the site owner that is not necessarily time based. An obvious example are the various tutorials offered on sites like LinkedIn, where the visitor is prompted to gradually increase the data in her profile. Less obvious examples would be cases where data indicate that the user is not making full use of the services to which he is entitled because of his relationship (for example, an Amazon Prime user who takes advantage of free shipping but not streaming movies). These example are not time based – they are related to the overall relationship rather than any specific task, and they are not directly cross-sell since we aren’t asking the user to spend additional money right away (although we fully expect that giving her more value will lead to increasing loyalty and increasing spend in the future). This *almost* fits your definition of Enrich, but you have described Enrich primarily in terms of giving the user access to general content that might be meaningful to someone like them (for example, presenting visitors in a specific industry case studies about how visitors in a similar industry are creating value with our products or services) rather than messaging that it is specific to what he individually can do to derive value from his relationship with us. As a quick aside, even though it’s a few years old and not directly oriented toward personalization on the web, I highly recommend Don Peppers and Martha Rogers book Managing Customer Relationships. Their Identify-Differentiate-Interact-Customize model is a strong foundation for having these kinds of discussions with customers. Thanks Rob for your close reading of this article apart. I think that’s a good point — the idea of educating or engaging the user over time (i.e. long-term, not just single session) is another interesting use case. To my mind that fits more closely under the Enrich spectrum, since it’s about providing incremental value over time, but agree there are elements of both. That actually makes me think of something I hadn’t really explored, that depending on the project, it may be totally useful (and advised) to adapt the model language slightly to fit your particular user or client need — this framework is more of a starting point to help you consider the core elements from which to build. As always I value your book club suggestions. Thanks, Jeffrey! I’ll look forward to comparing notes with you on things to think about during hold music at the next Event Apart DC. 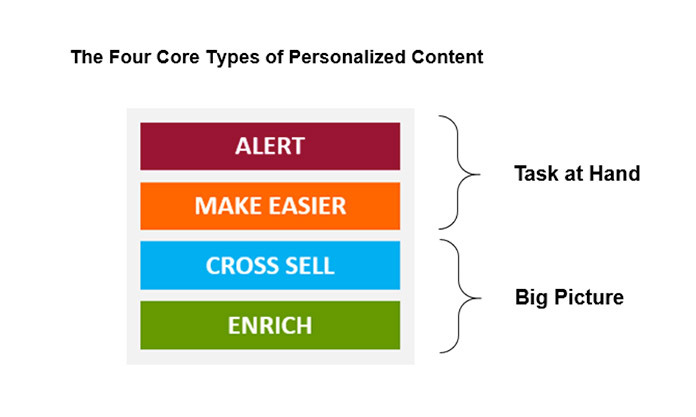 This is a thorough introduction to personalization and its impact on content strategy. Thanks for writing it Colin. awesome article!..i was just wrestling with the job of figuring how how to increase my website views, and this put it all together nicely.. Thanks for sharing thoughts on Content writing and content management . Post Panda updates from google now content plays vital role in Google rankings. So your approach and methodology of writing is really inspiring and helpful to all webmaster preparing content for there websites . Hemang — Great article from Cygnet-InfoTech, thanks for sharing. I think it’s a pretty realistic view of the challenges involved (including the cartoon). Also interesting stat on 10x increase from personalize banners, had not seen that specific study. Would be interested if it’s increased even more since 2013.
yoginetindia — thanks for the feedback. SEO and search engine rankings are a good point, and another little-explored area of personalization (as of yet). my understanding is that most search engines will still continue to index the canonical, i.e. master version of your site, not the personalized renditions. but there are some CMSs, e.g. Adobe that are pushing that idea. Thanks Niko! Good question — this was just an illustrative example, but you might be able to infer that information from several sources: either first-party data, e.g. 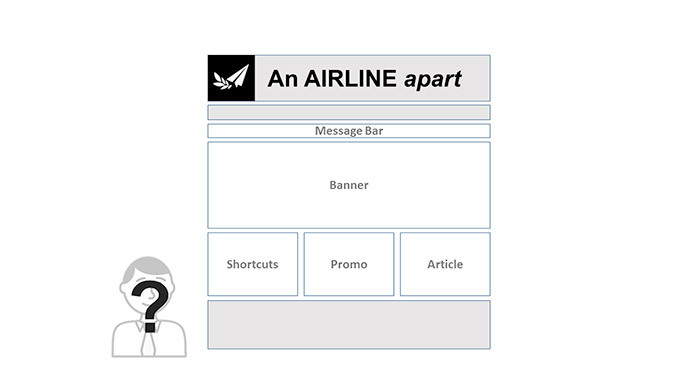 if the user has created a profile on our site (on airline sites for example, this type of information would often be present), or from a third party, like Facebook Connect or a Demandbase API. Wherever you get the information, the key is making sure you’re transparent to the user about using it to improve his or her experience overall. Thanks Dewi for reading and for the feedback!